This is a big topic I see butchered by a lot of people in the medical and fitness industry. We are told our core is weak by our doctors and other trusted health professionals so we head to the gym and start trying all these complex exercises or think adding weight to what we were doing before is going make our “core” stronger. Maybe you have never been to the gym before in your life. After being told your core is “weak” you start googling “core exercises for back pain” and you’re served a hot steaming pile of Dead Bugs, Planks, Bird Dogs and maybe some Stir the Pots. You get on the floor and start trying these magic back pain beating exercises out, only to have more pain and find yourself doubling up on your painkillers for the next few days. 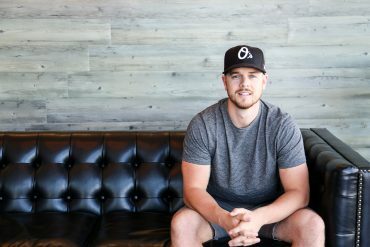 The problem with the medical and fitness industry when it comes to back pain is that most trainers and doctors don’t know how to respond to clients with real back pain and those that do would rather send you to someone who has more time to break down the process of rehabbing your lower back. So you’re left with nothing but pieces to the puzzle. We need to change that….seriously. Over the next week, we are going to dive into the nitty-gritty of where you are wasting time and exactly what you need when it comes to core training for lower back pain. Training for Strength vs Endurance when it comes to lower back pain. I am going to be completely honest with you on this one. At first glance, I would say NEITHER. Neither Strength or Endurance is king in all situations. They are both needed and have their time and place when it comes to core training for lower back pain but never start there. When it comes to putting the pieces that are often left out or overlooked in the fitness industry together I always suggest starting with coordination and muscle activation. Without these, you can’t properly train for endurance or strength in the first place. Often times you will have someone with lower back pain attempt a lot of the mainstream back pain reducing core exercises you find on the internet and end up in even more pain. Even when they figure out an “easier” way of doing it they still find themselves in more pain then before.This is where the big disconnect on priorities comes in with core training. Let’s unpack this a little more. Coordination and Muscle Activation. This is where you really should start. 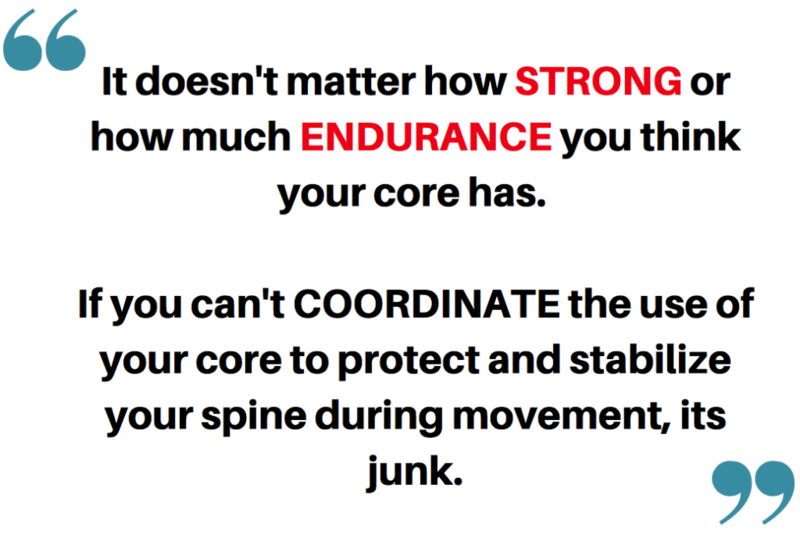 A big disconnect you see with people with lower back pain is really understanding how to use your core to bring stability to the spine. It’s not a lack of brute strength or being able to hold a plank for 3 minutes straight. 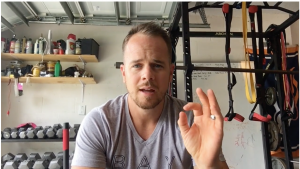 There is a marriage between breathing, bracing and movement that has to be understood and mastered if you want to really get benefit from training the core for relief. We will break these areas down in detail on Wednesday but today I want to focus and make sure you understand this key mindset shift from strength to coordination. Coordination can be summed up by this. Typically what back pain suffers don’t do well is understand how to not only stabilize their spine properly but maintain a healthy stable hold while moving. Usually what happens is people start with a good brace but as they get tired, stop focusing or simply start moving they lose the stability they once had. They have trained their brain to disconnect with the body once movement begins instead of engaging the mind and all the active muscles that are used with daily movement. A great example of this loss of coordination is the lumbar spine over working due to weak or underactive glutes. It’s not always about making the glutes STRONGER to help with back pain but learn how to turn the glutes ON when they are supposed to be active. With each step you make you have muscle “slings” that contract and relax with movement. These slings are simply chains of muscle and connective tissue that connects and is intertwined over joints and segments of the body. They are coordinated with the rest of the body in order for everything to move the way it should. If underactive muscles such as weak abdominal muscles or glutes are present, the body has to continue to connect these “slings”. In this case, it’s typically at the cost of our lower backs. This lack of coordination can manifest itself into a lot of different painful areas such as neck pain, elbow pain, knee pain and foot pain. It just depends on what you currently have going on. So when looking for help on core training you have to ask this one question. You can teach anyone to lay on their back while lifting and lowering their legs but can that person achieve that same muscles contraction and stability going from being on their back to standing upright? That’s the magic sauce that I feel 90% of back pain sufferers are missing. Don’t be worried! Something huge is coming next week but for now, we are going to dive into this topic hard this week so stay tuned! P.s I will be delivering even more content to those on my newsletter next week so if your not on it be sure to pick up my free gift today and don’t miss out on what’s to come! 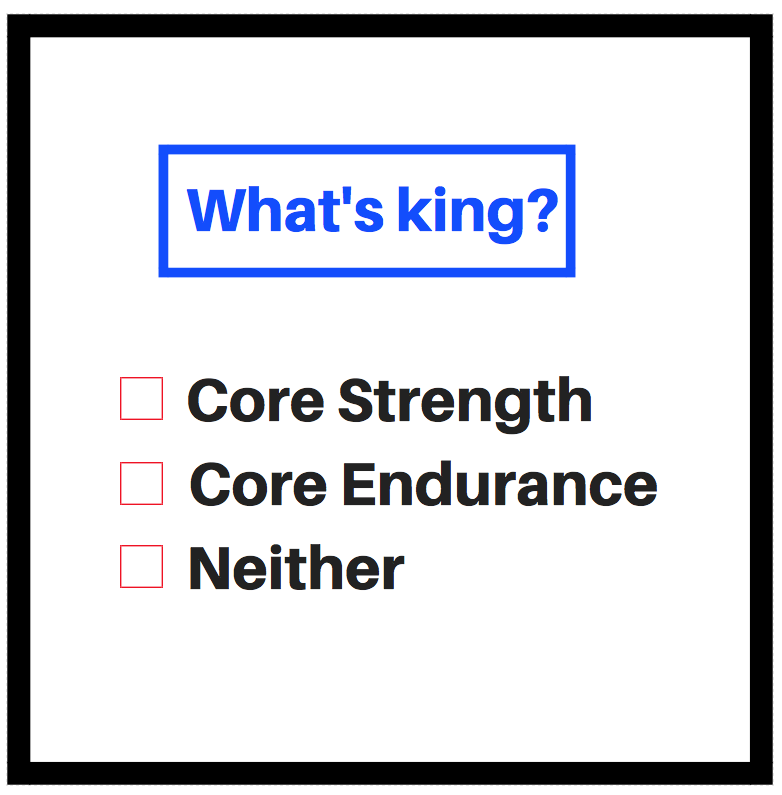 Home Core Training What is King: Core Strength, Core Endurance or Neither?